With neither a water-feature nor a wind-chime in sight, my apartment is hardly a model of feng shui-informed design. That said, for years I have unwittingly obeyed some of its golden rules: my home is full of plants, my bed is not positioned under a window, my cupboards are clutter-free and, most importantly, I share this Zen palace with a fish - a magnificent, electric blue, long-finned Siamese fighting fish. But don't let the good looks fool you, for as the name might imply, this fish has an appalling attitude, which I fear is redirecting any good energy straight off the balcony. Gills flare aggressively and fins flap flamenco-style every time I walk past the bowl, not to mention the constant surface-darting and aggressive bubble-blowing. 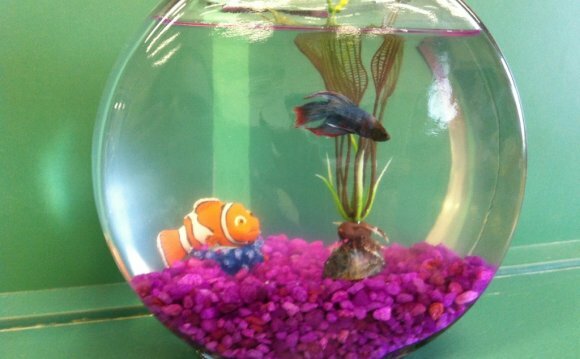 And though he lives in a beautiful, hand-blown glass bowl, with the usual furnishings of pebbles and plants, said fish lives alone, for he struggles to differentiate between friends and food. The male of the species, I discovered to my dismay, is known for killing and often eating those who invade his territory. How nice. However, I must perhaps take some responsibility for this creature's bad behaviour. Being unfamiliar with Betta Splendens as I was when the kind gentleman at the garden centre handed me a tub of regular fish food, I presumed that it would do. Not so. For a week, my finned friend devoured the morsels at lightning speed only to promptly spit the flakes back out in disgust. A quick Google search informed me that gourmet food was called for and now the carnivorous feeder feasts on delicious pellets of wheat flour and bloodworms. Some might call it justice that these bright red pellets, which are as small as salt granules, often find their way into my coffee and stick like fairy dust to my clothes. I suppose I should count myself lucky that the fish doesn't crave its ancestral diet of mosquito larvae from the rice paddies of Thailand. Despite his improved diet, this fish was still six centimetres of pure aggression. Another internet search revealed one potential reason why: according to feng shui masters, aquariums will never bring harmony to a home if positioned in the kitchen or the bedroom. By artistically arranging my fish bowl on the edge of a long marbled kitchen counter I had, in fact, channelled the House of Horrors rather than Little House on the Prairie.